16 of the worlds' best muay thai fighters are competing for the supreme title. The 15 episodes will be broadcasted across Asia on AXN in December 2007. Unfortunately I couldn't find any videos of his muay thai bouts or fight record... And the profile doesn't say anything about it... I hope he's gonna put up a good show. Check this out guys, ContenderAsiaFans.com is the brand new webpage for The Contender Asia show. New fighters were announced, new profiles uploaded. It's gonna be AWESOME !!! Watch the fights LIVE every Wed And Sat, buy tickets from Sistic. This is the place where you can show your support for your favourite contender and spread and/or collect rumors. If you're here only to copy and paste all we ask is to provide a link back from your page. If you're lucky enough (like me :P ) and you saw the fighters while they're in the show, remember what you signed, you cannot tell anything you see or hear there. Today, 11th of July 2007, The Muay Thai Contender Asia Press Conference took place at the Gallery Hotel, Amadeus Room, Singapore. UPDATE:Ozzy, Ozzy, Ozzy! Oi Oi Oi!! 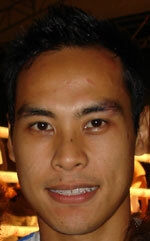 Also the Contender Asia Fans website is here: http://contender.asia where all the fight reports are.